The bestselling author of "A Tale Dark and Grimm" takes on medieval times in an exciting and hilarious new adventure about history, religion ... and farting dragons. 1242. On a dark night, travelers from across France cross paths at an inn and begin to tell stories of three children: William, an oblate on a mission from his monastery; Jacob, a Jewish boy who has fled his burning village; and Jeanne, a peasant girl who hides her prophetic visions. They are accompanied by Jeanne's loyal greyhound, Gwenforte ... recently brought back from the dead. Their adventures take them on a chase through France to escape prejudice and persecution and save precious and holy texts from being burned. They're taken captive by knights, sit alongside a king, and save the land from a farting dragon. And as their quest drives them forward to a final showdown at Mont Saint-Michel, all will come to question if these children can perform the miracles of saints. Beloved bestselling author Adam Gidwitz makes his long awaited return with his first new world since his hilarious and critically acclaimed Grimm series. 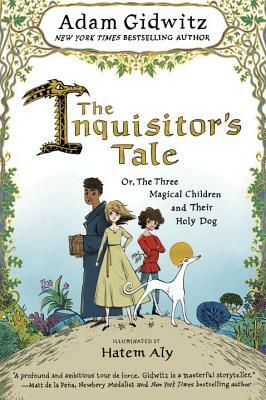 Filled with Adam's trademark style and humor, "The Inquisitor's Tale" is bold storytelling that's richly researched and adventure-packed.